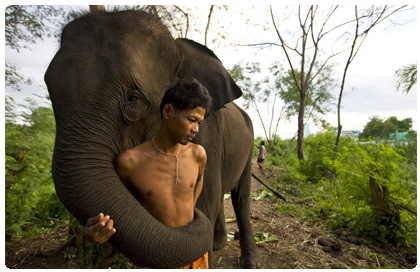 It can be said that elephants play a massive role in the Thai culture and their way of life. Elephants signify royal power, a good show of Buddhist art and architecture, and a spiritual mentor for people of all walks of life. In the ancient times, elephants roamed freely and in multitude in places such as Burma, Thailand, Laos, Cambodia and Vietnam. 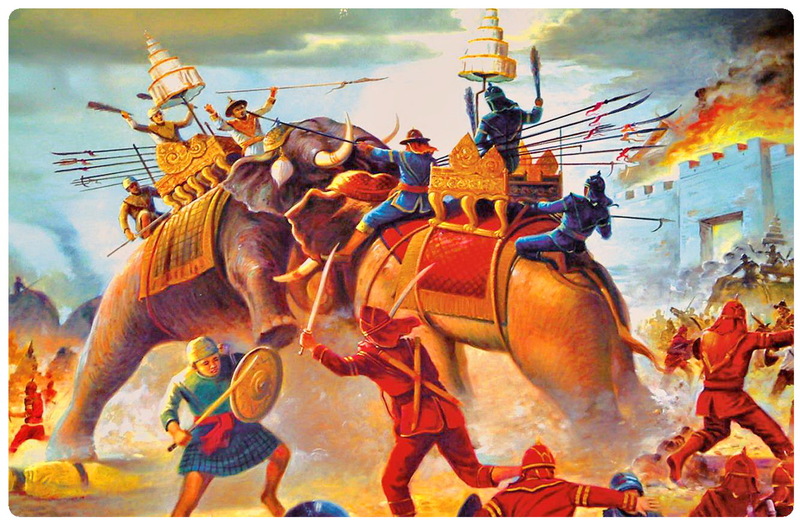 It was very helpful in the time of the Southeast Asian war, a Thai king of the late 17th century having had 20,000 war elephants trained for battle. Elephants in Thailand represent both power and peace. They are often used for very powerful physical tasks. And they have always been well loved. Elephants in Thailand today are limited to about 3000. Many of which can be found in various elephant camps around the country where they are trained to carry out forests and mountains job and for entertainment. 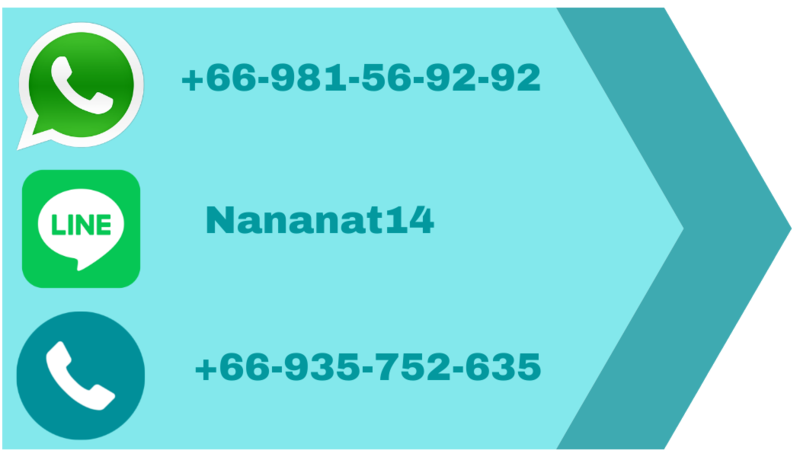 These are some of the many traditional roles the elephant has played in Thailand since the days of old Siam. * The elephant possess several wide attributes, and perhaps the most obvious is talent. * Talent for a stately presence, for delicate foot movement and agility, for intelligence on the field of sport, and at the same time a particular gentleness that makes the elephant not only a highly respected creature of the land but also one that is appreciated and loved. 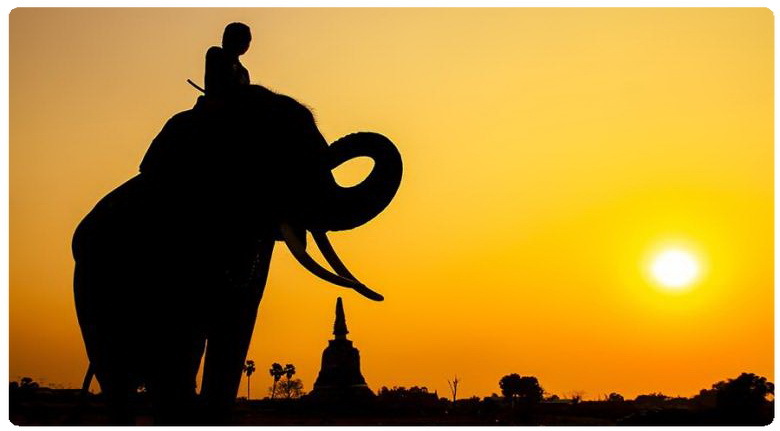 The people of Thailand recognize the white elephant as an important symbol of royal power. It started in ancient India, where the multi-headed elephant of the Vedic god was white and where, in one of the Buddhist Jataka Tales, Vessantara (Buddha) gave a white state elephant to a drought – stricken people because it was believed to have the power to bring rain. In Southeast Asian kingdoms, the white elephant has traditionally represented divine royal power. In the eyes of regional adversaries, the amount of white elephants held by a king is seen as his power, and the white elephant was the featured emblem of the national flag of Siam until the country was renamed “Thailand”. In Siam, the main importance of elephants has always been in warfare and the ancient kingdoms of Southeast Asia. It was the major means of transportation, and they constituted the main force of an army. The elephants match the same purpose as a horse cavalry in the west, the number of manned elephants for warfare often determined the ultimate winner of the war. This feature of War Elephants was most renowned in the 300-year-war between Burma and Thailand which resulted in Burma’s sacking of Ayutthaya in 1767. Currently, elephant war tactics are reformed at a number of Thailand’s elephant training centers. Called the “Kraal Paniad”, staged battles on elephant-back are an astounding display of elephants’ innate talent and ability to learn. 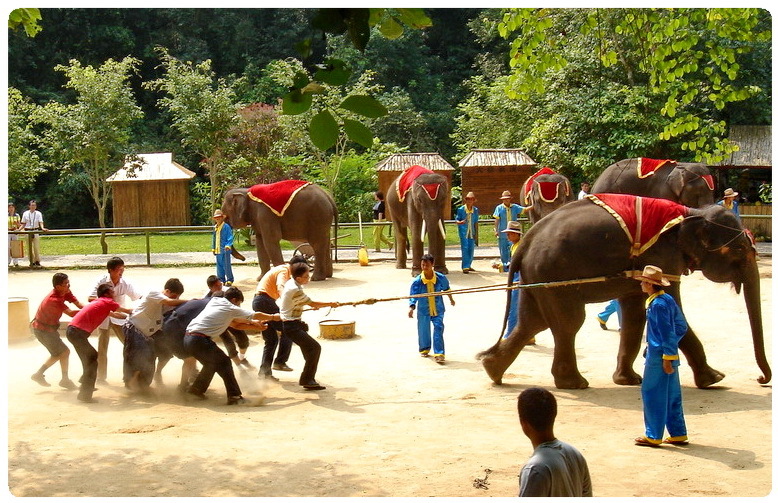 Here in Thailand, Elephant Racing is one of many sports the elephants were involved in. Races were actually part of the elephant war training in old Siam, where the elephants were lined up and on command charged. Today, elephants are trained on the delicate steps and maneuvers of such tactics in order to recreate the battle scenes of the “Kraal Paniad”. These races and accompanying tactics require the elephant to learn and respond to more than 60 separate commands. On the signal to take off, the elephants begin a stampede, and this quickly turns into a rhythmic, flowing ballet on the dust. The elephants are fast and as they gather momentum the race becomes a legit step performance. Elephants also have their own games in the privacy of the forest and it is regularly competitive, hence, they have a special talent for sports. One of these is a race competition on an obstacle course. In this case, elephant is required to select various items along the way, hold these with its trunk, and then go back them to the finish line. In one of Thailand’s elephant training centers, the objects are Coke bottles. The elephants also learn to play football. In this game, they use their trunks to move the ball around. the winner is the one with highest score. It is fun sports for the elephant and requires a little more thought than their traditional water games of spraying themselves and others. 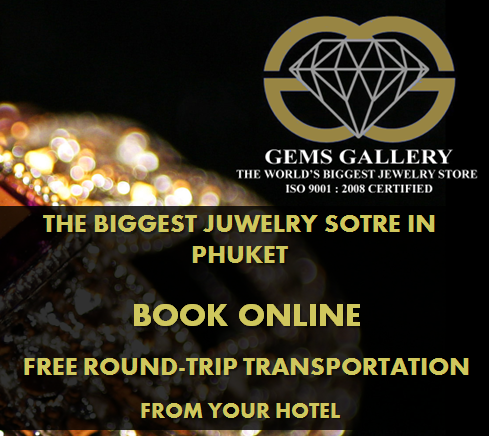 The Elephant Caravan is a very special trained function of the elephant in Thailand. The elephants are arranged in a line with their packs and their passengers can move over any terrain, however steep and treacherous. This was the reliable means of land transport in Thailand until railway and the automobile was invented. Today, the jungle and mountain areas are still the most desirable and the safest way to go. Elephants in a caravan have broad wooden seats strapped onto their backs and tied with heavy rope. Passengers and goods sit on these seats while the mahout, or trainer, rests on the elephant’s neck and guides to control it. An elephant caravan can contain any number of elephants. They all stay together because they like being with their own kind. If you want to experience traveling in an Elephant Caravan join one of our elephant trekking tours. The elephants play the game of Tug-o war with man. In Tug-‘o-War, they demonstrate their true physical power in a way that leaves no one in doubt. 70 men are required to bring one elephant to a draw in a Tug-o’-War contest. Some of Thailand’s training centers stage the same competition with men on horseback, and in this case one elephant requires six or seven competitors to give it a real contest. Most people think Trek is something like a walk or a hike on foot, and while this is true many of northern Thailand’s treks include at least part of the journey by elephant. This is just like to the caravan, and trekkers always find the ride on those wooden seats a bit more physically demanding than they thought possible. But there is nothing like the experience. The elephants travel dense jungle area on a trek. The elephants maintain balance by climbing steep hills of mud and earth, traverse ledges between tree lines and hillside drops, and all the while sway back and forth. It is unlikely for an elephant to become afraid in terrain like this. What will scare him is a car, a truck, or a helicopter overhead, but never the jungle. Just like people, elephants take friendship very important. In any elephant group the elephants tend to pair up and stay very close together with their friends. They have their likes and dislikes, of course, but in a caravan or on a trek for instance, the mahouts have to take special care in lining up the elephants before departure. They are arranged, one behind the other so that friends are together. The elephant will likely refuse to budge and the caravan will not move if separated from its friend. 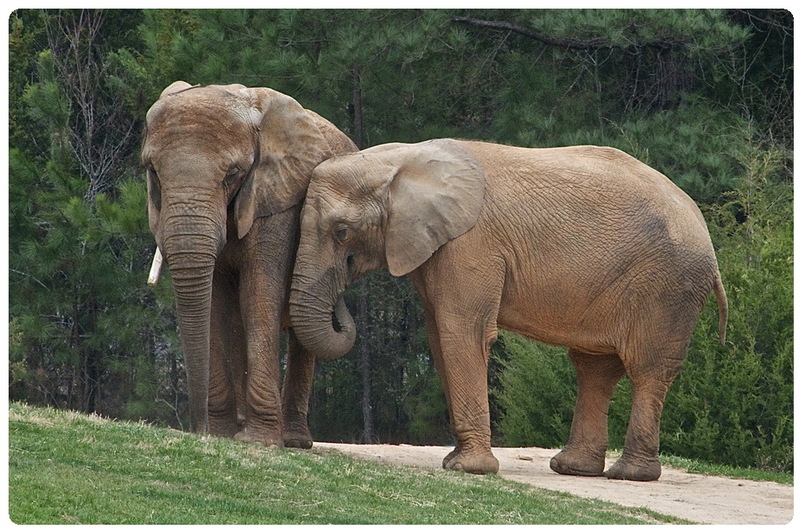 Elephant friendship is well noticed when the female is about ready to give birth. She searches for her friend and solicits help in delivery. Elephants are intelligent, nimble and have a natural way to their walk. They also love music very much. Elephants are trained to perform dance routines to various numbers in the rock, jazz and folk categories In Thailand. The dance is done by lining them up and when the music begins they receive the command to start. They sway and prance to the rhythm, trunks swinging, feet keeping time with the beat, and heads swaying to and fro. When the music changes, they’re steps change with it, perhaps from a fast tempo to a slow, melancholy waltz. Music is how the great circuses of the world train their elephants to perform. Hence, the elephant’s preference for music and talent for dance should come as surprise to us. The majority of Thailand’s elephants today are known as LOGGING. They learn this at the country’s various elephant camps and it’s a trade they enjoy. It is of important help in the economic contribution where elephants have been confirmed to be much more efficient than tractors and cables. Elephants often train for about 20 years before they are in shape to work as full, independent and experienced loggers. At the age of 20 they begin their 35-year career of work, and at 55 or 60 they retire. During these active days, they are entitled to fixed working hours, their lunch hour, and their rest periods. This creature is very powerful as it can pick up a log and move it almost anywhere. This can be proven at any of the elephant training centers in Thailand. Well-known as the strongest beasts of burden, Elephants have been revered in Thailand for many centuries as they were important in battle. Kings are mounted on Elephants fighting the Burmese to defend Thailand on many occasions. Elephants are also known for its brilliance, memory and pleasant nature. There is a saying that “marriage is like an elephant” – the husband is the front legs which helps to navigate, and the wife is back legs, providing support! Where to Ride an Elephant in Thailand?